Pros: Overall, Werner's book is just about a 'must' for budding LS-Series aficionados. Cons: The only things keeping this book from being 'excellent' rather than just very good, are teeny-tiny photos. The General Motors Generation Three Small-Block V8, the 'LS1', debuted in the 1997 Vette. A Camaro version came in 1998 followed by three truck engines in Chevy and GMC full-sized pickups for 1999. Now, a decade later, with millions of engines manufactured, a growing number of Gen IIIs in service may need overhauls and there's a certain part of the pool of those of interest to DIYs. That interest may be growing these days because of the country's current economic trauma forcing people to be cost conscious enough to consider rebuilding their own engine. 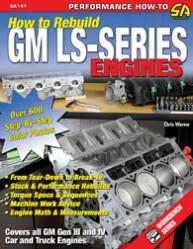 That brings us to Chris Werner's, new book How to Rebuild GM LS-Series Engines. The second title of what I call Car Tech's 'four volume set' on the LS seres. Anyone who works on a Gen III, or its newer sibling, Gen IV, and is doing heavy engine work, needs this book. Even if your not overhauling an LS motor, if you are into modern GM powertrain issues, a lot of the content in this title is valuable information. How to Rebuild GM LS-Series Engines is arranged in the Car Tech Workbook Series' usual format. It's divided into sections covering major parts of an engine overhaul, then subdivided into short articles discussing each step of the process. Sprinkled amongst that are sidebar stories on various important subjects. What we don't like about this format plagues many titles in Car Tech's 'Workbook Series' and that is pictures which are too small. In a instructional book like this, pictures can be of more value than text in demonstrating to the beginning DIY how to perform a task. In reviewing this book, there a number of occasions where I had to use a magnifying glass to see details in a picture illustrating a point made in the text. That is unacceptable and the only major problem which weakens this title's appeal. A portion of this book covers high-performance modification of Gen III/IV engines. Chris Werner told us via email that he wanted to continue the proven Car Tech 'formula' of mixing some performance with basic rebuild information. Gven the problem with itty-bitty photos, his publisher would have been better eliminating some of the performance discussion then use that space for larger, more useful pictures. Car Tech already has a good high-performance and racing LS-Series title in Will Handzel's outstanding How to Build High-Performance LS1/LS6 V-8s, so readers wanting hi-po information could be steered to that book. Other than its tiny photos, Car Tech's 'Workbook Series' format works quite well. The other notable deficiency of this book is its limited discussion of two characteristics in which the Gen III/IV engines differ from the traditional Small-Blocks and just about every other GM engine prior to the advent of the LS-Series. Many were produced with both 'negative deck-height' and 'negative piston-to-bore' clearances. While the book touches lightly on deck height, there's nothing about the piston clearance issue. Both are dramatic departures from the engine technology some LS-Series newbes might expect and, thus, deserved more in-depth coverage. In spite of those problems, overall, Werner's book is just about a 'must' for budding LS-Series aficionados. It's methods of instructions and the wide range of material makes the book valuable for both beginners as well as intermediates with previous experience with engine work but whom are taking their first steps into the Gen 3/4 arena. That said, I differ philosophically with the Author on a couple of issues. First, How to Rebuild GM LS-Series Engines advocates Sealed Power 'Plastigage' when setting bearing clearances. Werner's feels Plastigage is a better choice than 'cheap' measuring equipment. In my mind, that implies a bit of arrogance on the Author's part in assuming that DIYs will universally gravitate towards inaccurate tools. I disagree with that and feel that measuring with measuring tools of the same quality used in general machine shops-which can be purchased at reasonable prices-is a better choice than Plastigage. I polled a couple of engine builders and neither disagreed. Secondly was Warner's belief that impact tools should not be used during disassembly because they cause bolts to strip threads. Again, I polled a couple of engine builders I respect and both felt that was inaccurate. This reviewer (an 'advanced DIY' with 25+ years of experience) has never had a bolt hole thread failure solely due to use of an impact wrench during disassembly. While use of power tools during assembly should be left for production lines at GM Powertrain, if threads are going to strip on disassembly; it won't matter whether you are turning the bolt with a combination wrench, a 1/2-drive socket or an impact gun. When queried about this issue, the Author, also, cites 'work-hardening' of the bolt due to removal with impact tools as a threat. I say to that (as do engine builders and an spokesperson at Automotive Racing Products, the premier fastener manufacturer in the aftermarket)...bunk. But, again, those last two points are philosophical differences between the Author, engine builders, fastener engineers and an engine-building book reviewer, not issues which will prevent a good overhaul. You can rebuild an engine in an acceptable manner using Plastigage and restricting your self to hand tools during disassembly. You just might not be able to do it as accurately or as easily. Chris Werner's How to Rebuild GM LS-Series Engines is a great read for anyone interested in the deep-gearhead side of the Gen III/IV engines and pretty much a requirement if you're going to pull the motor out of your C5 or C6 for heavy maintenance. The only things keeping this book from being 'excellent' rather than just very good, are teeny-tiny photos.